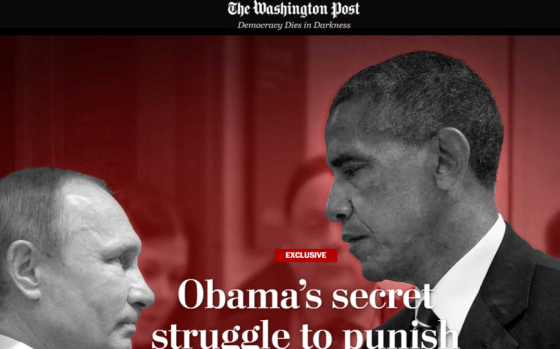 The latest propaganda piece from The Washington Post, “Obama’s secret struggle to punish Russia for Putin’s election assault,” is based, as usual, mostly on anonymous sources determined to make former President Barack Obama look good. The gist is that Obama tried his best to punish Russia for alleged interference in the 2016 election, but he fell short and left the matter in the hands of President Donald Trump, who has done nothing. So Trump is blamed for Obama’s failure. How convenient. Pardon me, but I don’t believe this for a moment. This “intelligence” may be what the Post seeks to expose—Russian “active measures” or disinformation. Remember that Obama won the 2012 election after dismissing his Republican opponent Mitt Romney’s claim that Russia was a geopolitical threat to the United States. Obama had also been caught on an open mic before the election promising to be “flexible” in changing his positions to benefit Russia. “These comments provide more evidence that Obama was never the anti-Russian figure he postured as in the final days of his second term,” we noted. The paragraph is designed to mask Obama’s indifference to Russian aggression in places like Crimea, Ukraine and Syria. In regard to the latter, Obama failed to save Syria from Russian aggression and facilitated a conflict—through secret arms shipments to the region—that now stands at 500,000 dead. Obama’s alleged “cautious” approach in the Middle East was to support jihadist groups in Syria and Libya, and back regimes such as the Muslim Brotherhood government in Egypt, which was overthrown by the military backed by the people. The hero in the Post account is Obama’s CIA director John Brennan, who joined the agency after admitting to voting for Moscow’s man in the 1976 presidential election, Gus Hall of the Communist Party USA. Suddenly, we are led to believe, as CIA director, he became anti-Russian after discovering a Moscow plot in 2016 to disrupt the presidential election. One paragraph in particular tells you everything you know about the anonymous sources behind this story. “Those closest to Obama defend the administration’s response to Russia’s meddling,” the Post said. Yes, indeed, those “closest to Obama” would certainly do so. There is absolutely no evidence whatsoever for this dramatic statement. It’s completely made up. Remember, this is the same Obama who once assured Putin that after he won his re-election campaign in 2012, he would have “more flexibility” with the Russian leader and be able to offer more concessions. Obama’s so-called “secret struggle to punish Russia for Putin’s election assault” exists in the minds of Post reporters who are waging a not-so-secret struggle to rehabilitate the former president’s disastrous foreign policy toward Russia and most of the rest of the world. Let’s not forget one more debacle—Obama’s deal with Russian client state Iran to facilitate the regime’s nuclear weapons program and world-wide terrorism. That may end up being another crime of the century, on par with President Bill Clinton’s deal with North Korea that was supposed to prevent the communist regime from getting its hands on nuclear weapons. Obama’s “cautious and deliberate” approach was to let the young man languish in a North Korean prison while being tortured to near death.